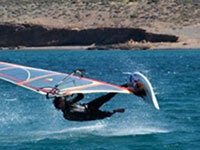 Book your Windsurf package below!!! Around the Palekastro area, the "Meltemi" wind increases its strength through the local thermal and funneling effect that gives the surface wind an additional 2 Beaufort. This makes Kouremenos bay one of the most wind-certain spots in Europe with wind statistics of 20-28 wind days per month from April to October. 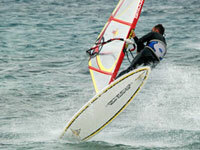 Apart from the the perfect swimming conditions for young and old and the "air conditioning effect" which has been enjoyed by many visitors to the area, the bay offers perfect, flat-water conditions close to the shore (due to the off-shore wind) as well as clear blue waters and is the perfect spot for those wishing to learn how to windsurf, but also for those who even though advanced, want to either practice or learn new surf moves. 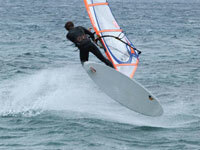 For those interested, there are 2 Windsurf stations on Kouremenos Beach (the only fully equipped ones on Crete), with teams of instructors to teach, equip or just instruct on new freestyle moves.